The first Convince & Convert Media produced book, Manipurated, is available now, and released December 1, 2015. 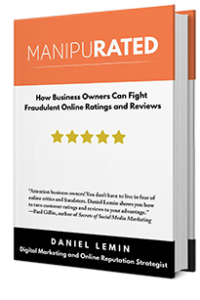 Manipurated is a business owner’s manifesto that exposes the inner workings of the multibillion-dollar online rating-and-review industry, and shows a roadmap to making these platforms work harder for their businesses. Manipurated gives business owners an insider’s view of how the multibillion-dollar ratings and reviews machine systematically stacks the cards against them—and more important, empowers business owners to fight back with a six-step playbook to defend, control, and enhance their business’s online reputation. Manipurated is a must-read for all business owners who depend on online reviews.